Keyence has introduced its new ‘Drive Scan’ IX Laser Scanning Sensor offering camera-based target position detection. The laser-based tracking and height detection system irradiates the laser to the specified location and calculates the distance with its CMOS sensor. The laser angle is adjusted through high-accuracy control of a MEMS mirror, based on the position information obtained by the camera enabling real-time, direct detection of height information for specified points even if the target position shifts. Line laser scanning is performed throughout the specified detection location, providing height data at multiple points. This height data is then averaged to ensure stability, which is especially useful when inspecting rough surfaces. Automatic adjustment of the light emitted from the laser and the light-receiving sensitivity of the CMOS enables a high dynamic range of x1.9 million which ensures stable detection with no influence from the target’s color or gloss. Multi-point height data is obtained by adjusting the light intensity and the light-receiving sensitivity. That data is used to extract an optimized composite result ensuring accurate measurement regardless of the reflectance of the part under measurement. Stable detection is possible without changing the position or orientation of the target. Real-time position correction eliminates the need for a jig or fixture to keep the target repeatable. A tilt correction function accommodates when the sensor head or target is tilted correcting the measured values. Exact heights can be detected by registering a reference plane. Images captured with four different lighting patterns are combined to make a single image with reduced glare ensuring optimal images can be captured for detection using only built-in lighting. With up to 16 detection tools that can be configured in a program, judgment can be performed for multiple locations for a given target. In addition, up to 32 programs can be saved and switched between, allowing for quick transition when production changes. The sensor enclosure is IP67 sensor rated ensures protection against dust and water; the cable connector can be rotated up to 330 degrees, allowing for easy cable routing during install. 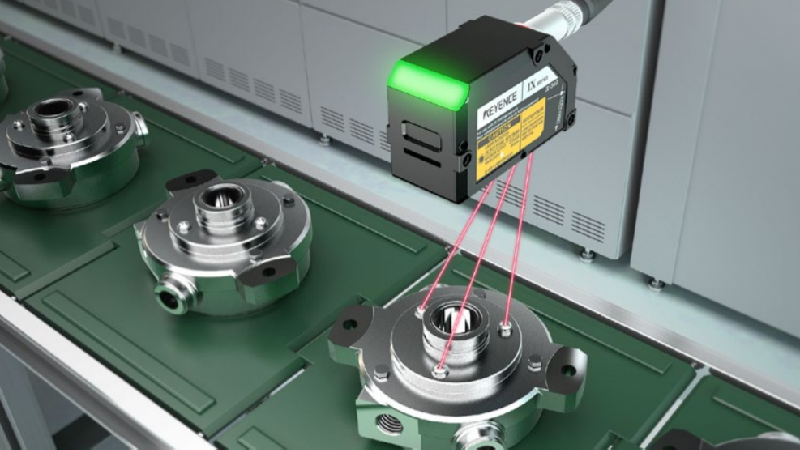 The IX-055 sensor model offers a measuring range 45-65mm and a repeatability of 10 µm while the IX-150 has a 100-200mm measuring range and a repeatability of 50 µm.